Out of the 24 High Courts, 17 are working on less than 65% of their approved strength, considerably waning the working capacity of the Judiciary. Though appointments of nearly 400 judges to the High Courts was one of the biggest tasks before the collegium headed by him, newly appointed Chief Justice T S Thakur Yesterday said he would commence the process only after the constitution bench delivered its judgment on how to improve the system and remove flaws. Tripura High Courts is the only one functioning with zero vacancy. As on December 1, 2015, Allahabad High Court has the largest number of vacancies, standing at 85. It is hence currently working at less than 50% of its approved strength. Besides, Chhattisgarh High Court is also working at less than 50% of its approved strength. Meghalaya and Sikkim High Courts are functioning with 1 vacancy each. 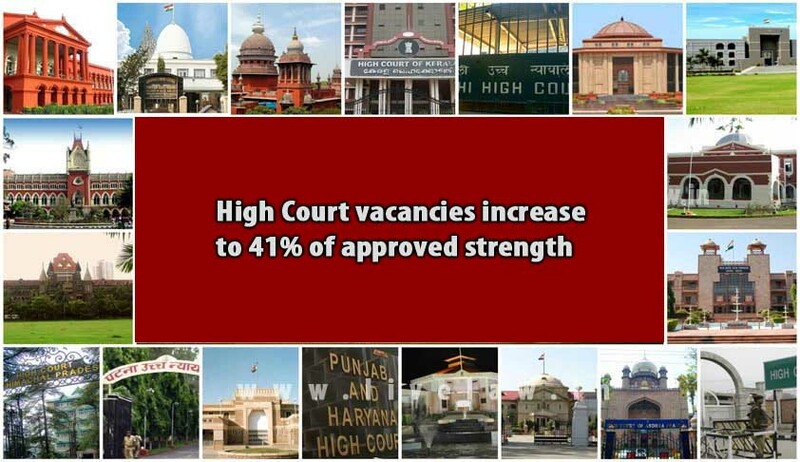 Even though Punjab and Haryana High Court has the second largest approved strength, it is working at 58% of that strength. With the High Courts functioning at 59% of their approved strength, the dream for reducing the pendency of cases is unlikely to materialize in the near future. In a major development after the National Judicial Appointments Commission was declared unconstitutional in a momentous decision rendered by the Constitutional bench of the Apex Court of India, the President of India had appointed 22 Additional Judges in various High Courts in the month of October. You may read more about the appointments here. With Justice T.S. Thakur sworn in as the 43rd Chief Justice of India, the need of the hour is for the Constitution Bench to complete its reform of the Collegium by laying down guidelines at the earliest. Only after the completion of the consequential hearing on the Collegium system, will the next Collegium begin its meetings, in order to fill the evermounting vacancies.